Business Intelligence Software: Which one is the best? How much do you really know about Microsoft BI? If you haven’t directly used it yourself, you probably only know the information you’ve heard directly from the Microsoft emails and advertisements that recommend their software. IT Central Station, however, is giving you the opportunity to discern how efficient and reliable products like Microsoft BI actually are. IT Central Station wants to make sure that you are using the most fitting enterprise software, applications, hardware, and services at your business so that you can work to your fullest potential. 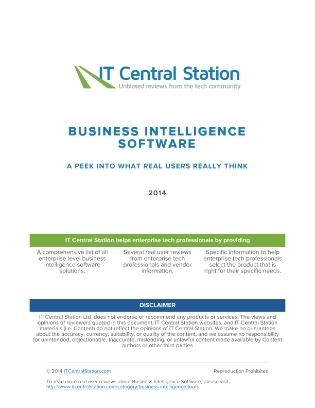 To ensure this, IT Central Station has created a comprehensive e-guide on Business Intelligence Software, where IT professionals, like you, share their experiences with specific vendors and their products. You will receive honest reviews of products like Microsoft BI, which include: the pros and cons of the product, the specific experiences of past users, feedback on the cost of the product, as well as what about the product needs improvement. This unbiased information from trusted IT professionals is sure to give you a leg up on your competitors.